If you know anything about Santa Claus, you know that one of his names is St. Nick. That’s because the modern day Santa character was fashioned after a real guy by the name of St. Nicholas. He lived from 270 AD to 343 AD. If you weren’t aware, St. Nicholas was a follower of Christ. The stories that are told from his life are quite epic and are way better than flying reindeer and magical snow globes. Just google his name and you’ll discover quite the collection of legends and traditions surrounding the guy. 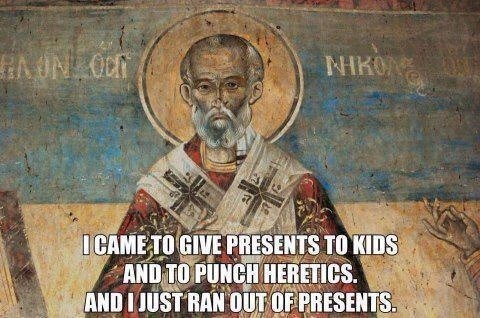 I just discovered another story that made me like St. Nick even more. He was a heretic puncher (or slapper depending on the version of the story that’s told). The jolly ol’ guy apparently had no patience for anyone defaming Jesus.